One of the biggest complaints about the new iPad Pro is that it can’t access USB storage. Or rather it can, but it can only see photos and videos on connected volumes. And those photos and videos can only be imported into the built-in iOS Photo Library. But pro photographers don’t necessarily want their zillions of photos cluttering up their iCloud Photo Library. They want to import images directly from their SD card into Lightroom, bypassing the Photo Library altogether. A simple shortcut to import photos, and delete the originals. You would run this from the Photos app after importing a bunch of images. Just select all the photos you just imported, then tap the share arrow to run this shortcut. It imports everything to Lightroom, and then deletes the originals from your camera roll. Or it should. My shortcut fails at the delete stage, but you get the idea. Import presets in Lightroom’s shortcut. “Ask When Run” makes a single shortcut very flexible. 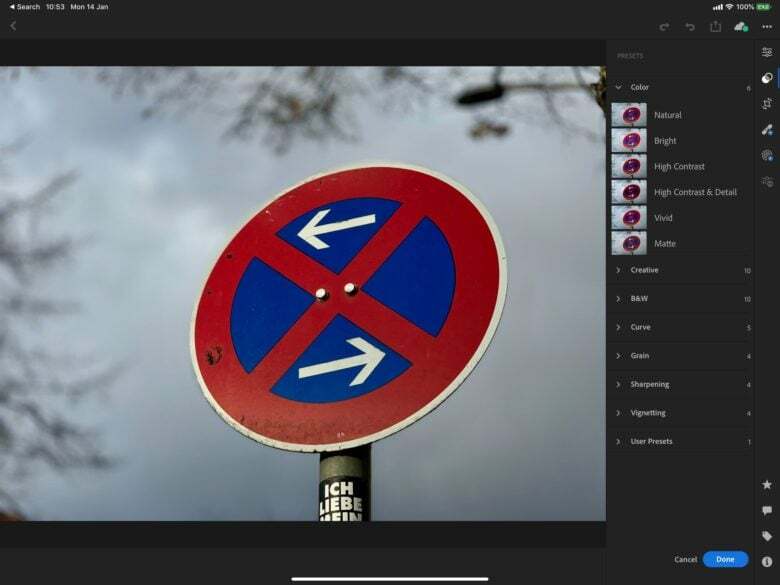 You can of course combine the new Lightroom shortcuts action with any other actions. You could just use it to replace the Save to Photo Album action in any other photo-based shortcut, for example. Or you could run a filter that only passes RAW images from a selection (based on their file extension — you can’t filter by RAW), and sends those to Lightroom. This is handy if you shoot RAW and JPG images in your camera, and want to send the RAWs to Lightroom and keep the JPGs in the Photos app. Hopefully iOS 13 will add support for hooking up USB storage, so you won’t need to go through the camera roll to get pictures into Lightroom. 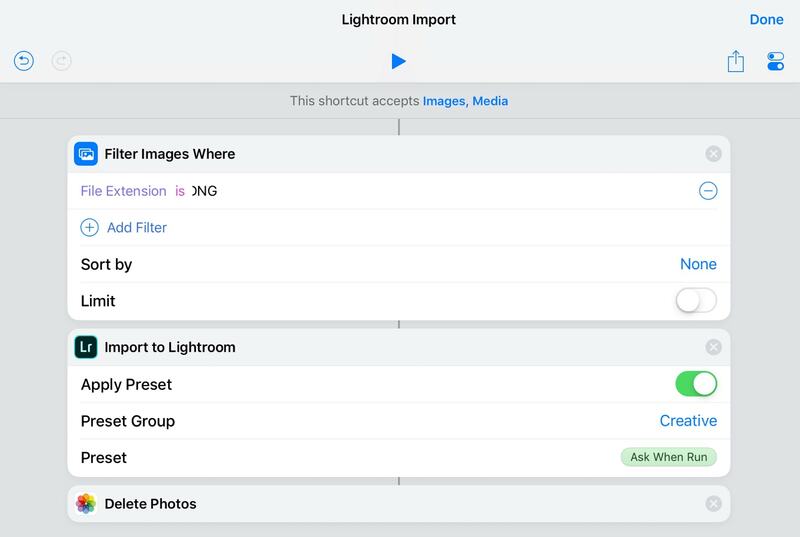 And if this happens, this new shortcut will still be super handy, as it will presumably still be possible to run shortcuts on photos in the Files app, just like you can do right now.